As I look out the window while writing this, the rain is falling. And it is heavy. I am smacked with the reality and must concede that the beautiful summer we had is over. As the seasons quickly transition from summer to fall and soon thereafter to winter, the weather will transition from sunny, warm, and dry to cloudy, cold, and damp. There is even talk we will experience a particularly cold and snowy winter this year. With that, I would like to reach out to you once again. 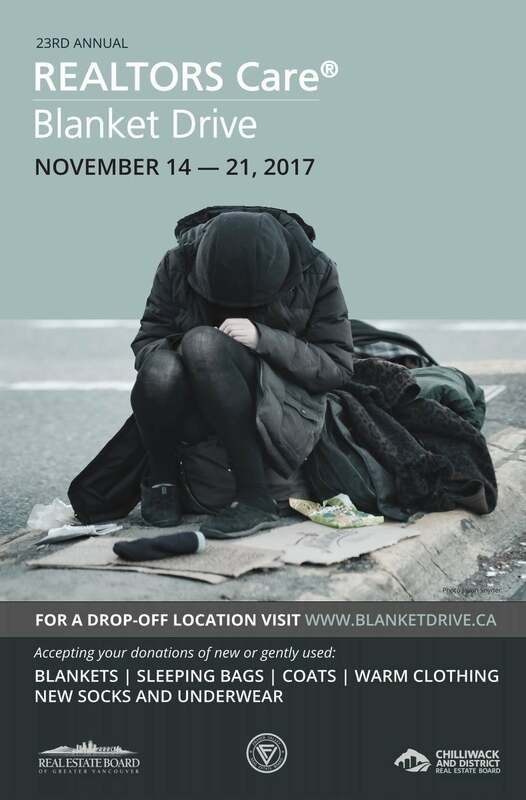 The annual Realtors Care Blanket Drive runs from November 14th to November 21st. This marks the 23rd year of the program. Over the years, over 300,000 people in our communities have been helped. The thanks belong to you for your donations! Should you have anything you would like to donate, please contact me so we can plan to have the items picked up or dropped off accordingly. Feel free to spread this message to family, friends, neighbours, etc.